ConMico Inc. — Series 6500 Agitator AM — holding vessel for slurries or epoxy mixtures. ConMico's Series 6500 AM agitator is an ideal solution for holding batch loads of grout mix produced in either the colloidal or paddle mixers until ready for use. Strategically placed rotating paddles keep the slurry in perfect suspension until called for by the injection pump. The sloped drum interior prevents a build-up of stale or settled grout and the mix remains active yet not overworked. Dimensions Approximately 57" x 32" x 55"
(1448 mm x 813 mm x 1397 mm) Approximately 65" x 40" x 59"
Operation Can be either pneumatic, electric or hydraulic powered. Custom size upon request. 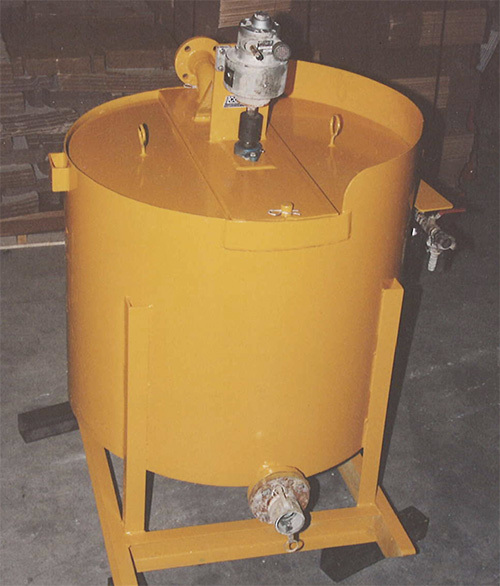 The Series 6500 Agitator AM — a uniquely designed holding vessel for slurries and epoxy mixtures.